If there’s one thing we can’t get enough of, it’s definitely cute little families made up of all sorts of furry little creatures! 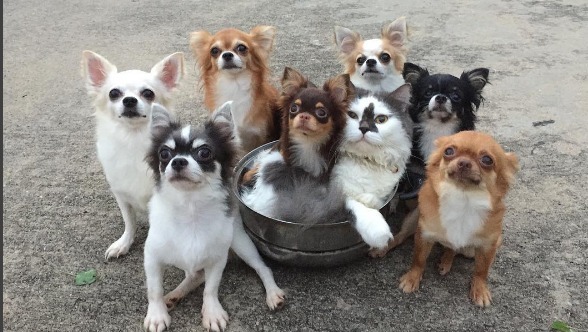 Seriously, inter-species animal friendships make our hearts melt, so is it any wonder we’re absolutely *in love* with this bunch of dogs, cat, and a tiny hamster who are all BFFs? They've got the group Halloween costume thing down to a T! OMG! Those little guys look sooo relaxed! Alright, this is the cutest thing we've ever seen. LOOK AT HOW TINY THAT HAMSTER IS!!! Look at how content this lil Chihuahua looks to be snuggling with his BFF. Seriously, they can write a book about how to pull off the perfect squad costume. Gahhh! They're so GD cute we can't handle it. How do they all just stay there like that, posing like little stars?